Jim Nussle is the Director of the Office of Management and Budget. On Tuesday, September 4, 2007, he was confirmed by the Senate with a broad, bipartisan vote. Jim began his 25 years of public service after his graduation from Luther College (BA ’83) in Decorah, IA, and from Drake University Law School (JD ’85) in Des Moines, IA. In 1986, he was elected the Delaware County Attorney, the chief law enforcement officer and prosecutor of the county. And in 1990, Jim ran for Congress and was elected the youngest Member of Congress at age 30. Jim served on key committees during his 16 years in the Congress, including the Agriculture, Banking, and Ways and Means Committees. He also was elected by his peers to Chair the House Budget Committee during some of the most challenging fiscal times our country has experienced including September 11th, economic recession, and the global war on terror. Jim successfully developed and approved six budgets which helped reduce the deficit and restrain government spending while investing in our economic growth and national security. In 2007 Jim retired from Congress after he was chosen to be the Republican nominee for Governor of Iowa in 2006. Jim and his wife Karen live in Manchester, Iowa, with his two teenage children. Mr. McMillin is the Deputy Director at the Office of Management and Budget (OMB). In this senior capacity, Mr. McMillin directly assists in the development of the Federal budget and execution of the President's programs and policies. 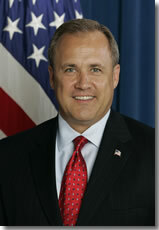 Prior to his current position, from November 2005 to June 2006, McMillin served President George W. Bush as deputy assistant to the President and advisor to Chiefs of Staff Andrew Card and Joshua Bolten. 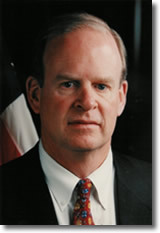 Mr. McMillin first served OMB from December 2001 to November 2005 as Program Associate Director for General Government Programs. In this role, he was responsible for budget and management oversight of six Cabinet agencies. From 1991 to 2001, Mr. McMillin served on the staff of the Senate Committee on Banking, Housing and Urban Affairs and on the staff of Senator Phil Gramm. During that time, he served as Senator Gramm's Legislative Director, Financial Economist and Legislative Assistant, directly handling major budget and tax legislation. Mr. McMillin received his bachelor's degree from the University of Texas at Austin. He resides in Virginia with his wife, Dawn, and their two sons, Spencer and Christian.